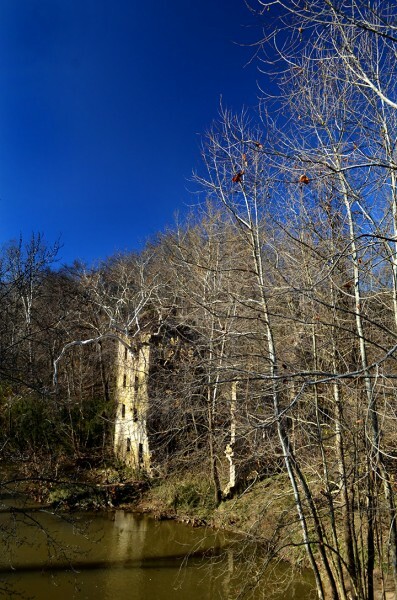 A couple of weeks ago, a member of the Old, Abandoned and Interesting Places – Missouri Facebook group posted a photo of Old Burnt Mill in Perry county. It didn’t sound familiar to me, and none of my East Perry county friends knew where it was, so Google was the next place to turn. 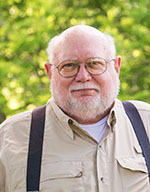 My virtual buddy, James Baughn, of course, had already written about it on his Pavement Ends Missourian blog in 2010.In addition to the mill, he wrote about the oldest road in Missouri. I encourage you to follow the link to his blog. It’s always interesting reading. Take I-55 north to the Brewer interchange (Exit 135). Make a left on US 61. Bear left on Route NN. After 3½ miles, turn left on Perry County Road 840. Drive down the hill and look for the mill on the right while crossing the bridge. Here’s a link to a Google map I prepared showing the route to Old Burnt Mill from Cape. 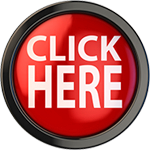 It’s interactive, so you can zoom in and out. Meanwhile, she’s looking out her window and said, “I think I’ve found the mill.” She, being a wife, even if not mine, was, of course, correct. You can see from this photo taken from the bridge that it would be really hard, if not impossible, to spot if the leaves were on the trees and bushes. 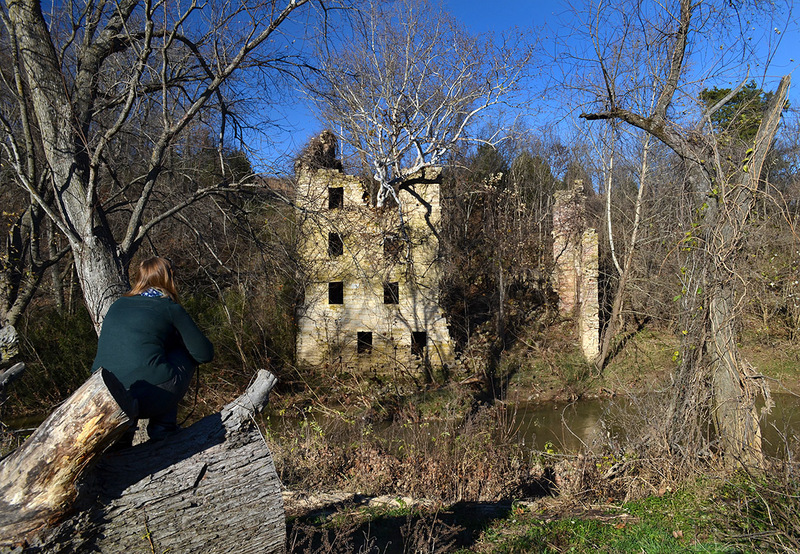 A 1963 Missourian story tells the interesting and convoluted story of the mill. The land it is on was acquired by Amose Rowark and Fransisco Valle prior to the Louisiana Purchase. A grist mill was built sometime around 1818 and changed hands a few times. A young man named Thomas J. Brady, who had been involved in the California Gold Rush, blew into town with a sack full of gold and bought half interest in the mill for $4,000. He married a local gal, and became so well-regarded that the mill became known as Brady’s Mill, even though he was only a half-owner. In the 1850s, the mill and mill race were destroyed by a flood. The owners were determined to build a structure that could defy the elements. The four-story stone building was erected at the water’s edge to that the strong current caused by the dam would flow through the ground floor to turn the giant stones used to grind the wheat into flour. When the race and mill were completed, the story goes, a barrel of whiskey was rolled out to celebrate. “The men became fired with the whiskey and declared that the Almighty Himself could not destroy the race or the mill again. Employee Nicholas Rimboch locked up the mill and went home on the evening of October 12, 1866. One his way to work the next morning, he was stopped and told the mill had burned. When he got there, the ruins were still smouldering. The cause of the fire was never determined, but there were some interesting rumors floating around. One of them was that Brady sent his son back East to secure insurance on the mill. His son, allegedly, spent the money on liquor, and returned home without the insurance, something he didn’t share with his father. His father, hoping for an insurance windfall, set fire to the mill. After the fire, one woman said she saw Brady being chased through the woods by his gun-toting half-partner. Brady “departed the community” the day after the mill burned. Years later, a body was found when a nearby pond was drained. It is unknown if the body was Brady. 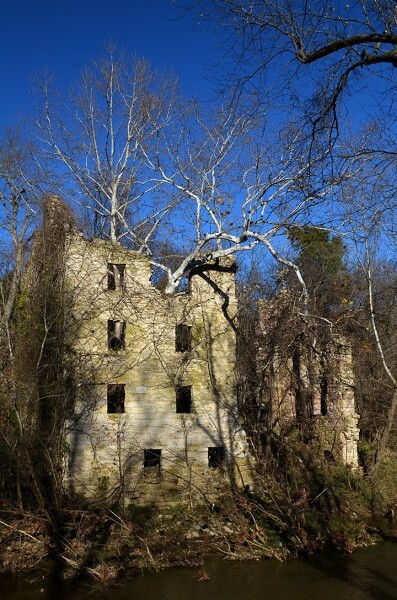 Perhaps that’s one of the reasons there are tales the mill is haunted. These photos were all taken from across the creek. I didn’t want to fight my way through a fairly solid row of brambles and bushes to get to the steep, muddy slope that led to the mill. And, despite the fact that the stone structure looks much like it did in 1963 photos, I didn’t want to be standing next to it when it decided to give up the ghost (and make me one). The other story of the haunting is that the owner lived nearby and came home a found his wife cheating, so he had a huge fight with her. She ran from the house and as she ran down the hill, he shot and killed her, hence its her ghost you see running across the field…. Some people if not all do not know what they are talking about.. First the old house on the hill use to be a cabin\holding house for prisoners. Where they were sold off the front steps.. Now the story’s about it burning is true as well as it being haunted some may not believe it.. The mill was actually carried in in horse and buggy.. Travel on the oldest road in Southeast missouri.. Which goes from highway nn in Perry county and ends in mine la motte in Madison county and came from there out west.. I lived I that house for 15 years! How interesting, if only those walls could talk! Ah, a ghost story along with forgotten and unknown, to me at least, mill built with gold from the California gold rush! Ken your wondering and writing never cease to start my day with a sense of wonder and a smile. 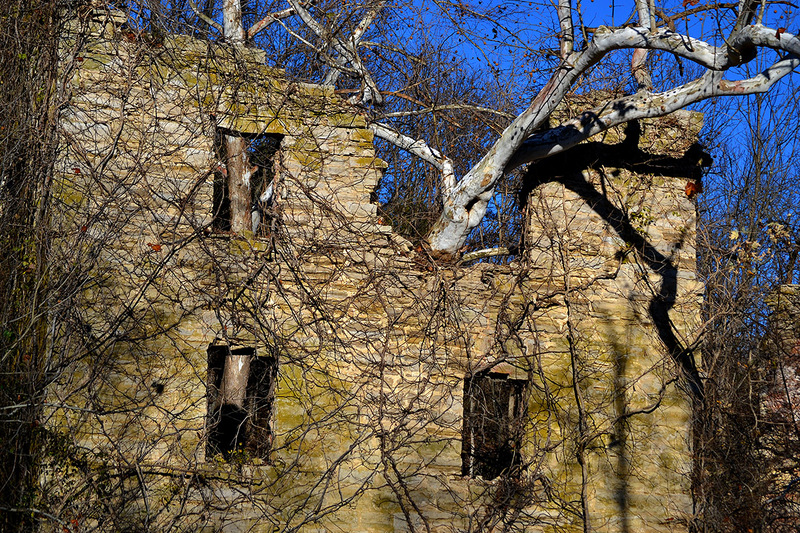 In addition to the storied building, I am fascinated by the tree that appears to grow out of the building, and may be part of the demise of the building. Comparing your pictures with those of Mr. Baughns from 2010, appears the tree continues to grow despite the rubble. Thank you for taking us on this most fascinating trip, Ken! Amazing the folk lore that follows this mill. Some but not all the fact above are true. Brady may have had gold, but he more likely lived in Ste. Genevieve with his mother and stepfather, John Scott, a well known attorney with a colorful history of his own. Brady actually died in 1860, and was buried in the old cemetery in Ste. Genevieve. His widow, Laura Entler Brady moved to the state of Iowa. 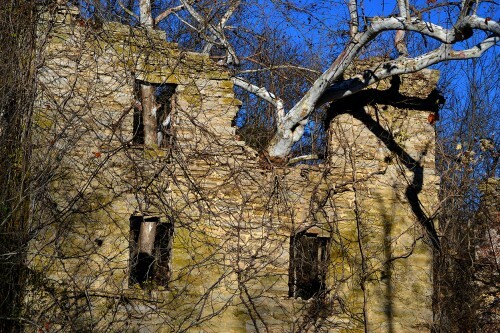 This story of the murder of the mill has been intertwined with an actual murder and the burning of the mill in nearby St. Mary MO in 1858, which was soon rebuilt. 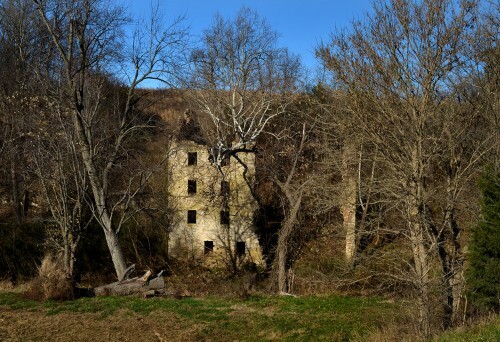 Nicholas Rimbach was my great grandfather, a immigrant from Saxony Germany, who has been hired by one Schaaf to make repairs to the mill, which had been inoperable, probably since the demise of Brady some six years before the fire. It was actually the father of Schaaf who shot and killed his son Henry in the mill at St. Mary. More re the mill .. it is nearly invisible in summer because of a law about waterways in MO, which I am not familiar with. Having collected old photographs, and taken hundreds of pictures myself the mill has deteriorated more since 1976 than in the years before. Only one photo has been found of the mill before the first corner fell around 1900. I have a second photo of the mill taken shortly after that corner collapsed. In the photo here it does seem that the tree is winning! 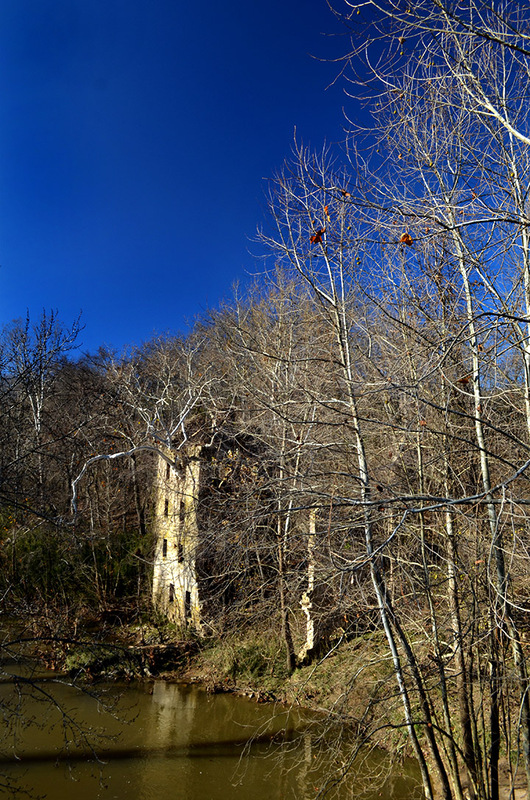 The only still intact wall is the one left, which can only be viewed from the creek bed. Love please share all your photos! I lived on the house on the land with my grandmother and I haven’t seen those photos in years! Yes I am very familiar with this site my aunt and uncle own the house that is joined to the property. I think I’ve met you a few times Jermey. I’m Amanda and Dyllan’s cousin! I grew up and live 5 minutes away from this. Never knew the whole back story, I don’t think anybody really knew it. Really cool to read about it and how it came to be. I drive by it everyday on the way to and from work. For us ..it’s just the reason we call the road “burnt mill” road. Loved the pics and history lessons! Snakiest place I ever went to swim and we did explore close up and personal back in the 90’s. Can’t say I’d be brave enough to try that now. It’s good to be reminded of the mill’s story, Ken. Among the few paintings left to me by my grandfather, S. P. Neal, is one of this mill, probably done in the 1960s. The story makes his painting more interesting. Today I’ll post an image of the work on my website, SaunteringPilgrim.com. 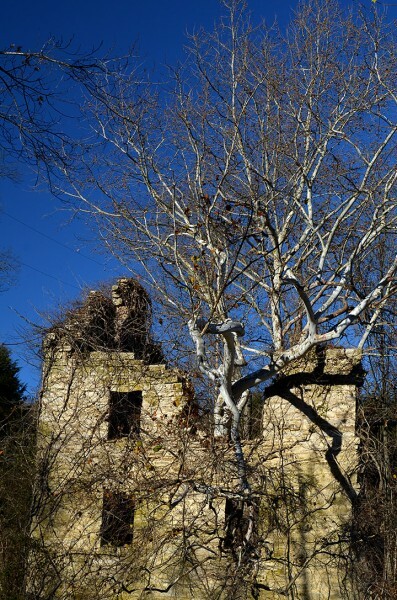 What does anyone know of the original house on the Burnt Mill property? The walls are very thick and the cellar shows several rooms made of stone. Im sure its a rebuild on an older foundation. Does anyone have photos or drawings of the original?